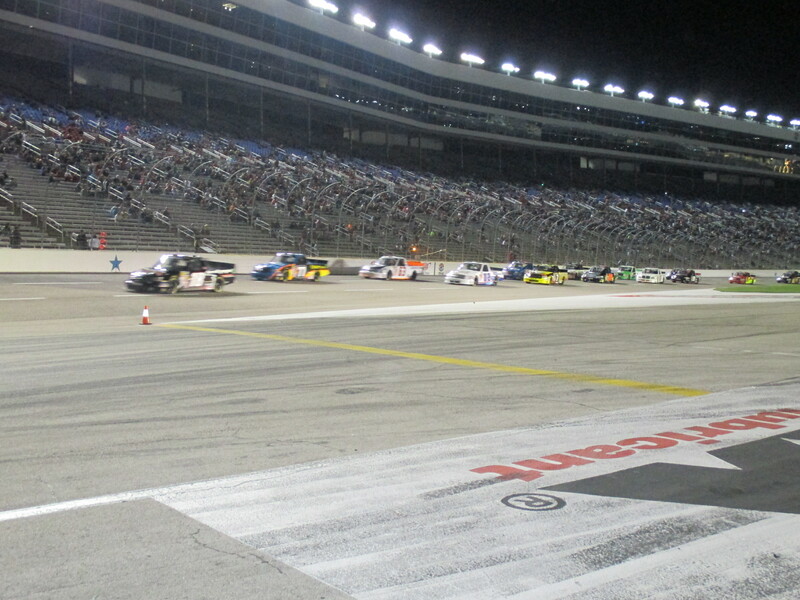 Last month was the final month in the Chase Championship for NASCAR, and Texas Motor Speedway was host to the third from the last race. The two leaders, Matt Kenseth and Jimmie Johnson, were tied and it was apparent that the stage was set for a showdown in Texas. A media center display of all the contenders titled DEADLOCKED with #20 and #48 barrels positioned to blow up conveyed the importance around the TMS race. 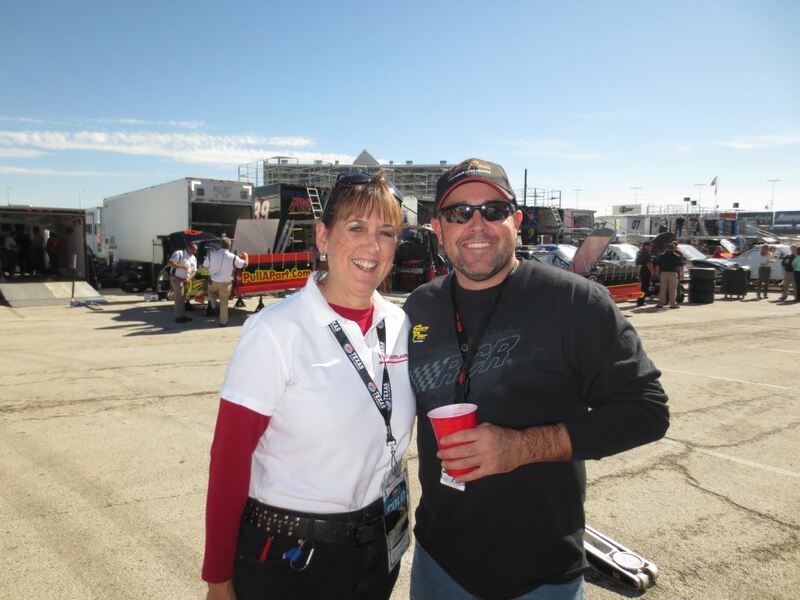 Needless to say, this sportswriter was beyond “in her element” with one of her favorite drivers right in the mix! Day 1 — Unlike June when only the trucks and Indy cars were there for the two garage areas, the trucks and their humongous haulers took over the Infield Parking Paddock leaving media parking at slim pickins’. Because of a further walk to the Media Center, this necessitated my carrying everything I might need throughout the day. Due to anticipated temperature changes throughout the day, I looked like I needed my own hauler as I started the trek from my car with my “stuff.” Once settled in my work area and after perusing the schedule, I retraced my steps to the “garage” area and watched the process for NASCAR inspection of the trucks. There were inspectors everywhere — some measuring the trucks and some under hoods inspecting parts. Parts were sealed and once qualified the truck was impounded until the race the next day. I paused at Brendan Gaughan’s truck as an inspector finished scrutinizing a large part. “Did his engine pass?” I inquired. The inspector grinned. “This here is the carburetor” and then went into a long explanation of what he was looking for. I heard a snicker and turned to find Brendan standing there. Wanting to overshadow my naivety of car parts and knowing my favorite truck driver had played basketball at Georgetown, I switched subjects to the hoops. I was defeated there also when Gaughan reminded me about former Hoya coach John Thompson and company taking the “slamma” out of my “jamma” Houston Cougars. Following inspections, there were two truck practices. We bailed during the second, as we needed to get home to give out the seven bags of candy to our six Trick or Treaters! 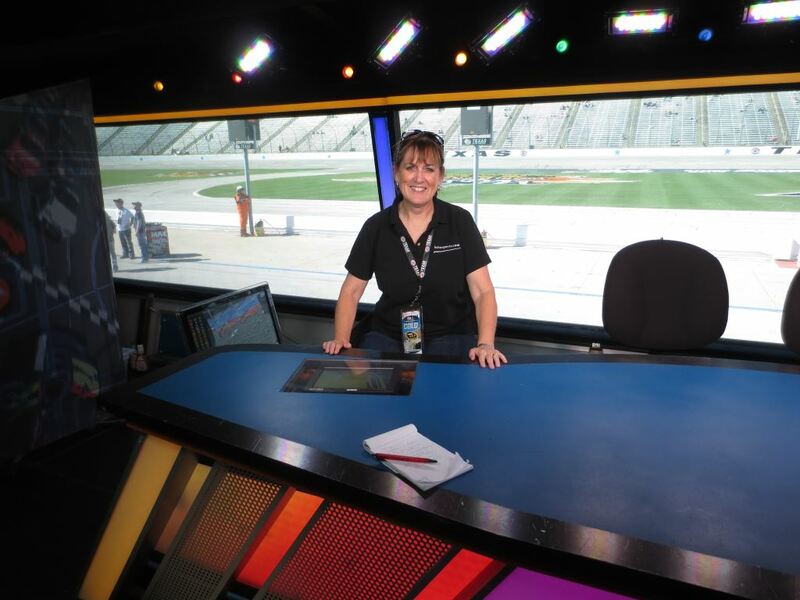 Day 2 — The morning started out sadly with the announcement of Atlanta Motor Speedway’s Marketing Director Marcy Scott’s battle with cancer ending in her passing. Not only had she interacted with several of my peers in the media, but at one time was Matt Kenseth’s PR person. 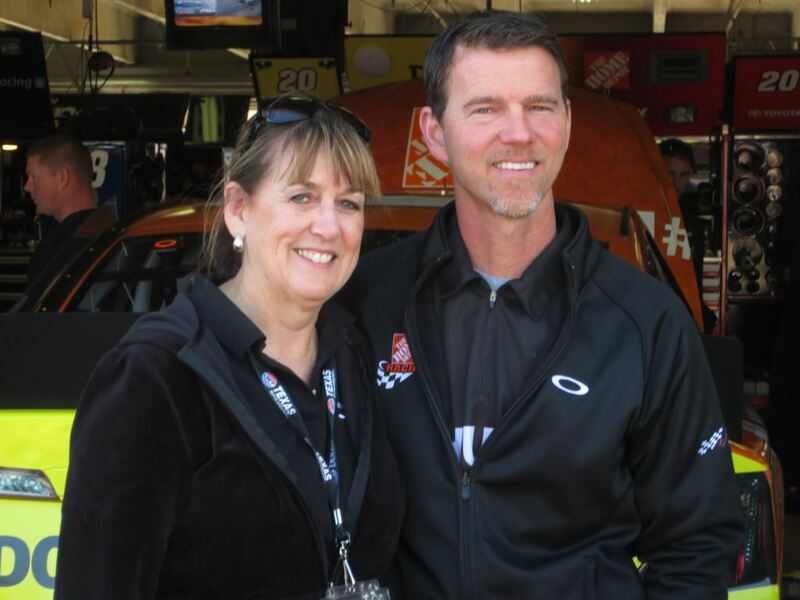 The sharing of Marcy stories ended with the arrival of Sprint Cup driver Martin Truex, Jr. He was there to end weeks of speculation of whom he would be driving for next year — Furniture Row. 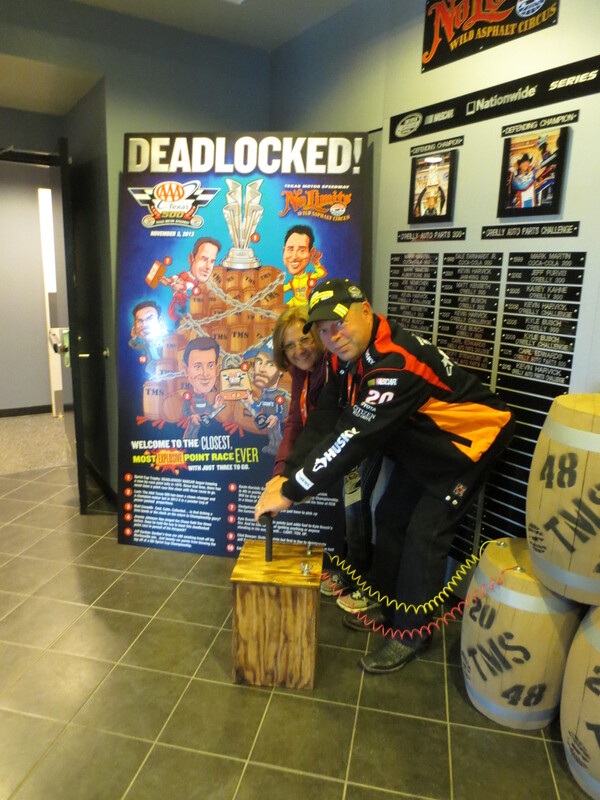 The next arrival was Matt Kenseth. One of the questions asked was how he felt knowing that “some fans are rooting for you to win the championship because they’re rooting against Jimmie Johnson.” He smiled and explained that’s how sports are and went into how some fans root for a dynasty and some for the underdog. He looked across the room. 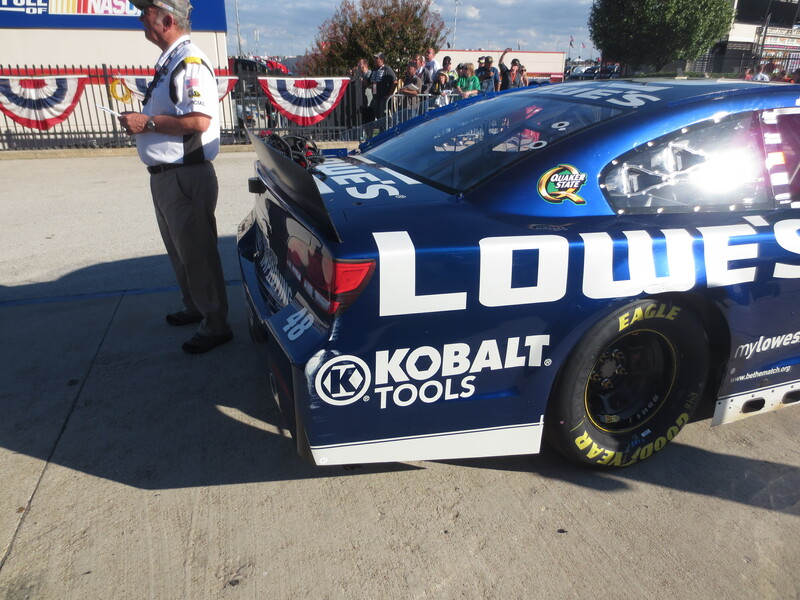 The “dynasty” had just entered – Jimmie Johnson. Matt fielded some more questions, and as he left the room, the two shared a friendly handshake. Despite the demeanor some other drivers portrayed in competition, those two men had the upmost respect for each other, both on and off the track. As with Matt, the reporters’ hype with Johnson was around the “intense battle.” Jimmie assured all he and Matt were friends off the track and shared many of the same values including family, being laid back, and foremost, respect for each other when it came to racing. Following JJ was Kyle Busch. I wanted to ask him how it felt being booed during introductions but thought better of it. 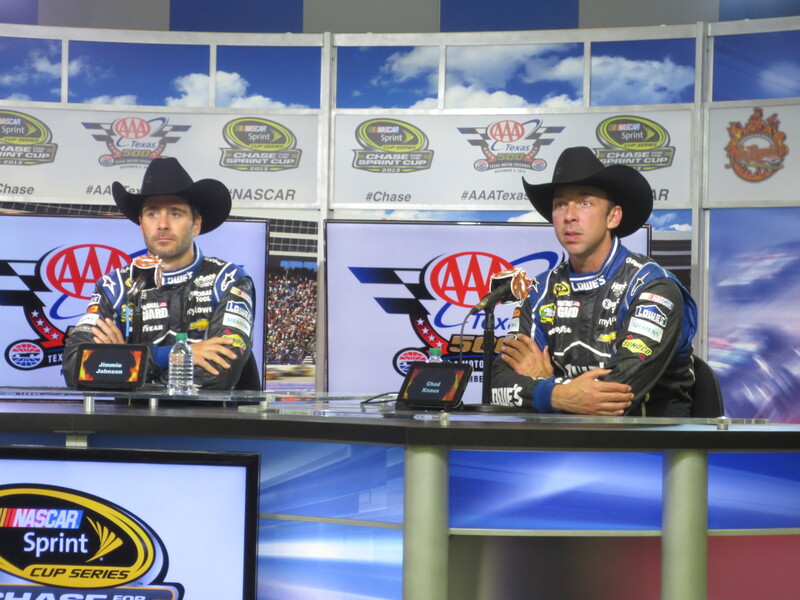 Instead, my fascination was on how he hoped to sweep all three races at Texas. The interviews ended just as Andy Hall, PR at ESPN, arrived to take Rick and me on a tour of the ESPN Production Complex located outside the race stands. Our first stop was the area containing wardrobe for all the on-air personalities as well as the roving pit reporters for ESPN. Each garment bag was neatly labeled and contained different colored outfits for each day. I found out that roving reporter Dr. Jerry Punch was really a medical doctor who had saved driver Rusty Wallace’s life back in 1989. Now the two were working alongside each other at ESPN. Attached to the large tent was a hauler containing offices and a conference room. Adjacent were several haulers containing massive rolls of cables. We climbed the stairs to one of them and found ourselves inside the “brains” of the production. Lined on one wall were seventy-five monitors for HD cameras positioned for the races. 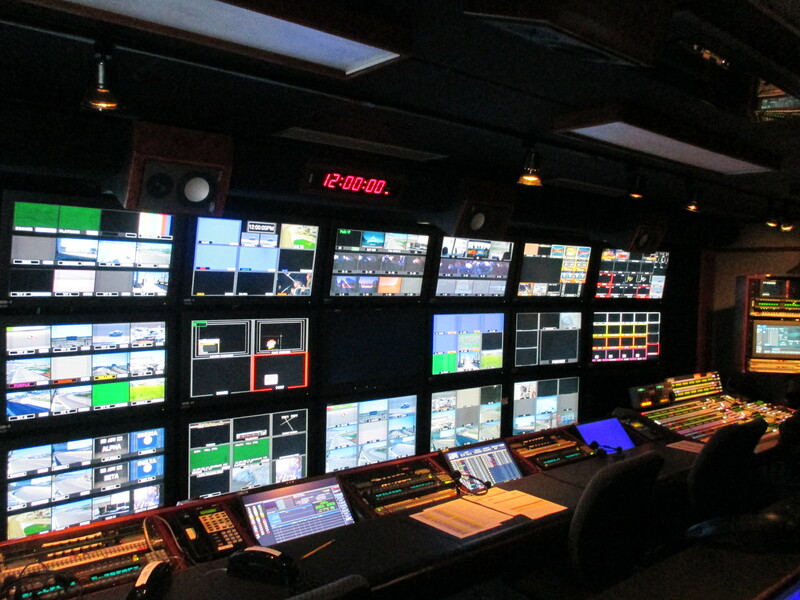 These supported in-car cameras, manned cameras, handheld, robotic on-track, robotics in Pit Studio, Crewcams, pit overheads, Jib cameras, Grasscam, POV cameras including the announcing booth, race control, flag stand and Chopper Cam. Monitors were dedicated to the leaders as well as competing drivers, in-car and pit stalls. There were two rows of seats where the producer, director and staff monitored all the camera shots for their immediate use on live TV. Even though there was nothing going on while we were in there, I felt the still air of intensity in the room. Andy pointed out that the challenge in covering motorsports was that there were no breaks in the action like in baseball between innings and football with halftime. He explained that in addition to catching all the action, there had to be a balance when running ads. That is why you rarely see shots of people in the stands. Andy also explained how the sun can cause disruption with the satellites especially in the fall. From there, we headed back into the pit area to the production hauler for on-air personalities. We climbed up the stairs and entered into the actual set for Countdown to NASCAR and the race. 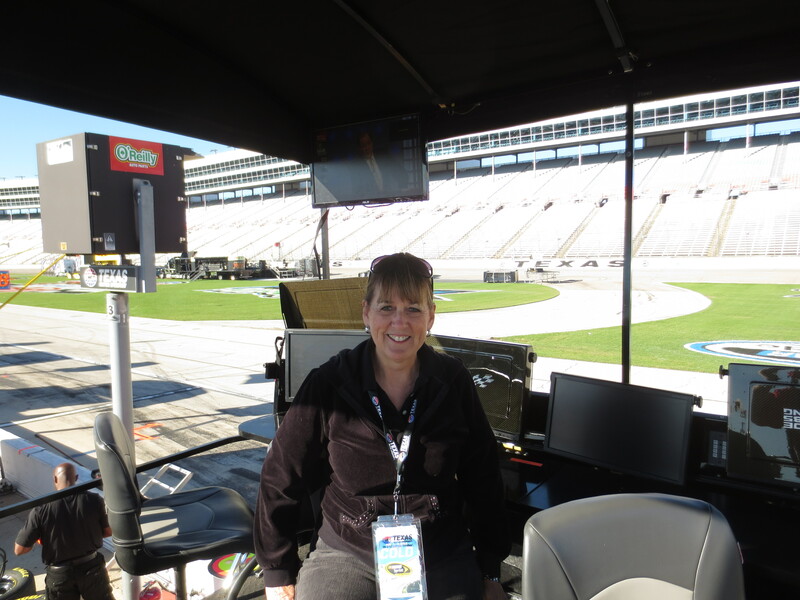 I timidly asked if I could sit in Nicole Briscoe’s chair. Once settled in, I smiled at the three cameras positioned and felt right at home. Andy and Rick chuckled when I offered to sit in for Nicole, who was going out on maternity leave. After the tour was a working lunch and more interviews with Darrell Wallace, Jr., Jeff Gordon, Danica Patrick and Nationwide Championship Leader, Austin Dillon. I felt the generation gap during Darrell’s interview when he shared that he didn’t even have a driver’s license when he started racing. He said the coolest thing he had experienced so far was being asked to appear on Arsenio Hall (and not knowing who he was) as well as being followed on Twitter by Tyler Bates. The rest of the afternoon was busy on the track with qualifying for the trucks, the Sprint Cup cars and final practice for Nationwide cars. Meanwhile pit row was sprouting up crew chief stands for the truck series that evening. 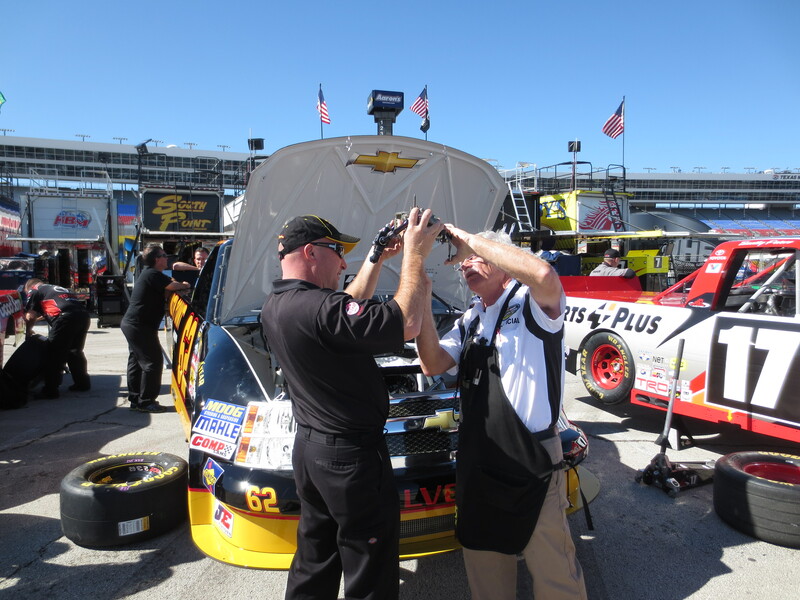 In qualifying, the spring’s race winner, Jeb Burton, grabbed the pole for trucks. Later Carl Edwards won his first Sprint Cup pole at Texas. A fall chill encompassed the air as the truck drivers took to the track for the WinStar World Casino race. Ty Dillon dominated the race leading all but seventeen laps. Brendan finished fourth. Day 3 – The morning was spent roaming the Nationwide garage during inspection, watching those cars qualify and the Sprint cars practice twice. Easy on the eyes Travis Pastranais (and 17-time medal winner at the X Games) was being interviewed in the Nationwide garage area after qualifying 39th. 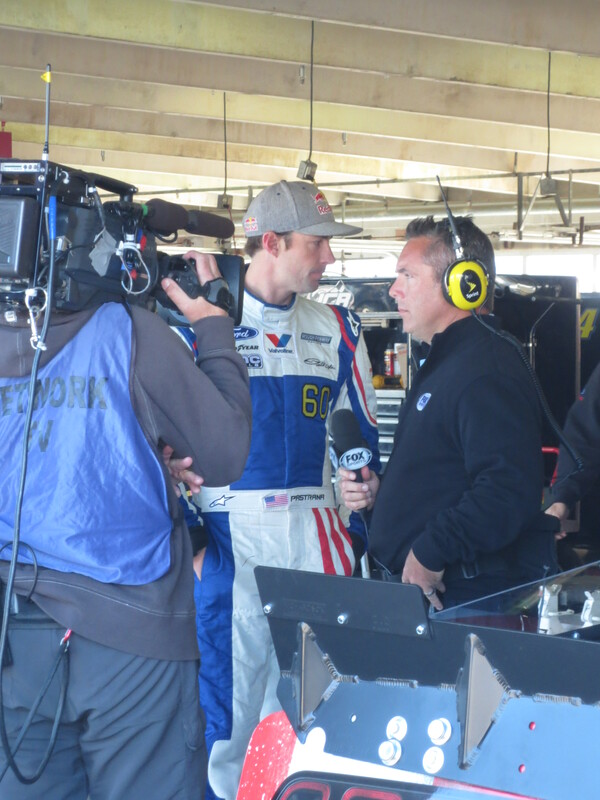 “I really need a win” he told FOX Sports’ Herme Sadler. I am not the Einstein of racing, but I thought to myself, “He needs to quit being in the wrong place at the wrong time,” collecting six DNFs (Did not finish) this year. Also, during my garage visit, I met the oldest active driver in NASCAR, Morgan Shepherd. The rough faced seventy-one year old looked discouraged as he climbed out of his #89. Unless there were a couple of wrecks during qualifying, he would not see action in the race. Back at the media center, there was a collective gasp while we were monitoring on TV the practice session as Jimmie Johnson’s car brushed the wall. I bolted out of my chair and back up to track to assess the damage. The champion had dodged a bullet. Thank goodness the Nationwide race was in the afternoon, as I was already worn out trying to keep up with who was doing what and when. Several drivers were participating in both the race that day and the Sprint Cup the next day. Last year’s cup winner, Brad Keselowski ,a participant in all three Texas races, won the Nationwide race later that afternoon. Day 4 – Despite gaining an hour of sleep with the time-change, I didn’t get much rest since Rick had to be back at the track early for his pace-car ride with Landon Cassill, a driver for both car series. Claire B Lang of SiriusXM rode in the front seat interviewing Landon as they did laps around the track. Unfortunately, there were cables crossing the track for the pre-race ceremonies so they did not get up to the high speeds I experienced in the spring. I found a crew member setting up the crew chief stand for Matt Kenseth. I always wanted to sit in one. The next thing I knew I was climbing the vertical ladder with the guy pleading for me to be careful. All I can say is the view is much better from Jason Ratcliff’s chair!! I wanna be a Crew Chief when I grow up! We headed next to the Sprint Cup garage where inspections had started. Surprisingly, many of the crew chiefs and crews were approachable. 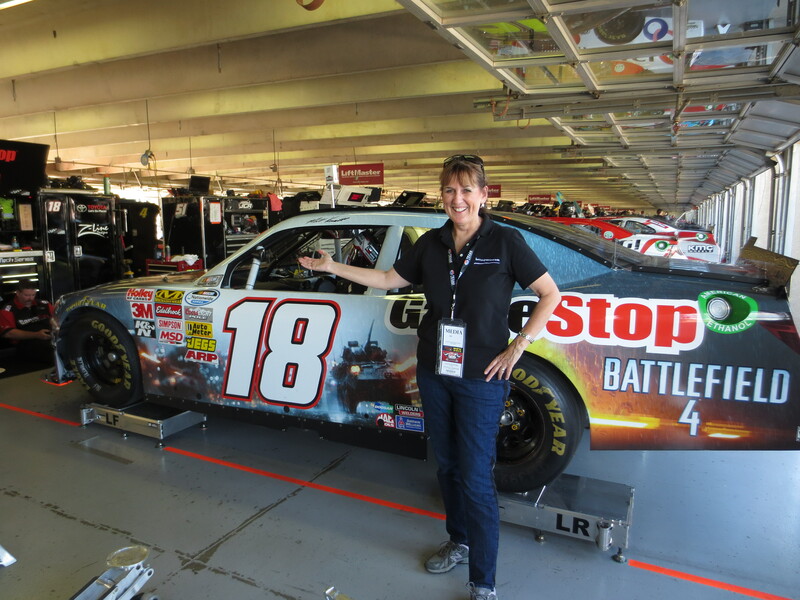 I had my picture taken with Jason Ratcliff and several of the cars waiting for inspection. One thing I discovered was that the headlamps and taillights were actually decals instead of the real thing. Multitudes of fans were gathering in the garage area and NASCAR rep Laura Finley was caught in the middle of the crowd control. “Please, if you’re not with the team, stay behind the yellow line.” As I started to step back, she said, “You’re fine.” I thought to myself, “I love this job!” The next hour was spent back at the media center posting pictures and updates on Facebook and Twitter. It was then I found out that Claire had aired my post-race question to Brad the night before on SiriusXM. I was so glad that inquiring about changing shadows and the setting sun on the track wasn’t such a dumb question after all! It was soon race time so it was back out to the track for pre-race ceremonies. Rick positioned himself at the photographers’ well at Turn 1 while I wandered up and down the pit. 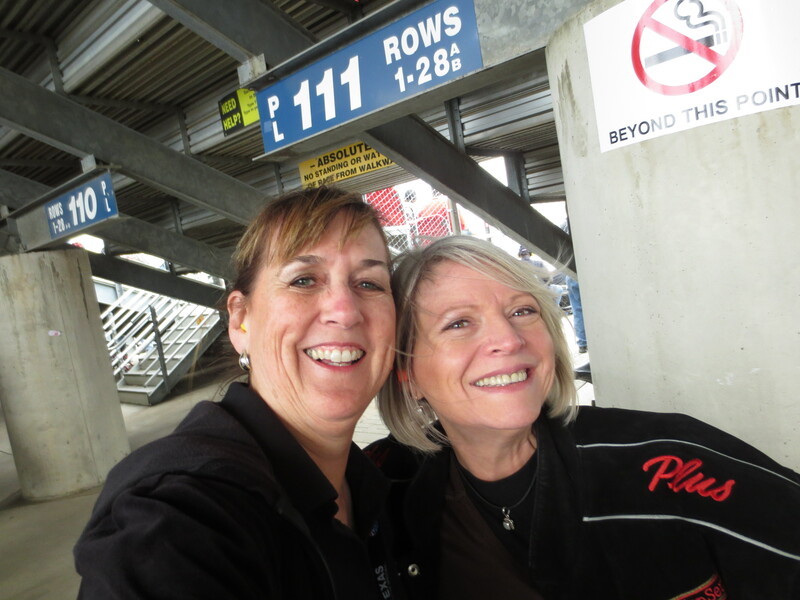 During the race, I ventured up to the grandstands to look for Hill Country’s Denise LeMeilleur attending the race. Out of breath from the long climb to row sixty, I reached her row to find she was not there! On the return trip, I ran into Denise coming from her car carrying blankets. Yes, the cold front had arrived! Back in the warm media center, I watched the rest of the race. The media center crowd is supposed to remain unbiased during the race, but it was hard to miss the massive groan when contender Kenseth received a speeding penalty on pit row on Lap 175. This meant him repositioning to the end of the cars on the lead lap. This would come back to haunt him by race’s end. Despite his fast car, Matt could not make up the lost time the rest of the race. His fourth place finish saw him plunge to second place in the Chase, making strong finishes and preferably wins imperative at Phoenix and Homestead for the Chase title. Jimmie Johnson won the race. How does the story end? Brendan & I are now twittering back and forth about college basketball, Travis “retired” from his brief stint in NASCAR and Jimmie added another title to his racing resume, never looking back after leaving Texas. A disappointed Kenseth ended up the bridesmaid and left his fans thinking “What Ifs” around the Texas race. I am still eating Halloween candy. And Nicole’s vacated ESPN chair? <sigh> Mike Massaro sat there instead of me.